It’s the favorite time of the month at Mathews... Zoo Trivia! 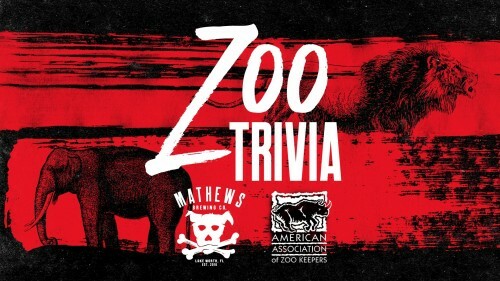 Mathews Brewing Company has partnered with Palm Beach Zoo Chapter AAZK to bring you “Are You Smarter Than a Zookeeper” Trivia, the third Tuesday of every month. Come enjoy a fresh, cold beer while putting your animal knowledge to the test and learning about AAZK’s conservation efforts. Trivia begins at 7:00pm, featuring DJ 561, and we have $1 off all pints all night. Hungry? Tucker Duke’s will be in the outside beer garden to grill up some burgers and other good eats.